The Birsay Earl's Palace is a 16th-century residence on the shores of Birsay Bay, built by Earl Robert Stewart. Extensive walls still stand, though not to any great height. Earl Robert was known for his harsh treatment of his people and may have used forced labour to build his palace. The house was constructed around a courtyard, and several ranges of buildings around the inner yard can still be seen. The location is as impressive as the palace itself; the views across to the Brough of Birsay are superb. Robert Stewart was the half-brother of Mary, Queen of Scots, the illegitimate son of James V and his mistress, Euphemia Elphinstone. 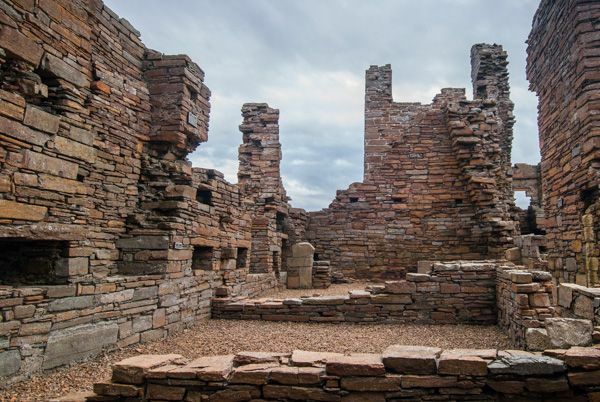 Stewart began building a residence at Birsay, in the north-west corner of Orkney Mainland, in 1569. The Latin inscription over the door of the new palace suggested that Stewart considered himself king in his northern domain. He certainly acted like a king, ruling his Orkney estates with an iron fist. 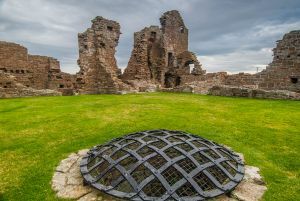 The residents complained of Stewart's heavy hand, and he was held in prison for a time, but the incarceration made no difference to Stewart's harsh treatment of the islanders. James VI made Stewart Earl of Orkney in 1581, and Birsay became the new Earl's favourite residence. Earl Robert'a son was named Patrick, and he gained the Earldom when his father died in 1593. The islanders might have sighed with relief when Earl Robert died, but if so, they were in for a shock, for the son was worse than the father. He was dubbed 'Black Patie', and he treated the islanders with astounding harshness and cruelty, even by the standards of the day. 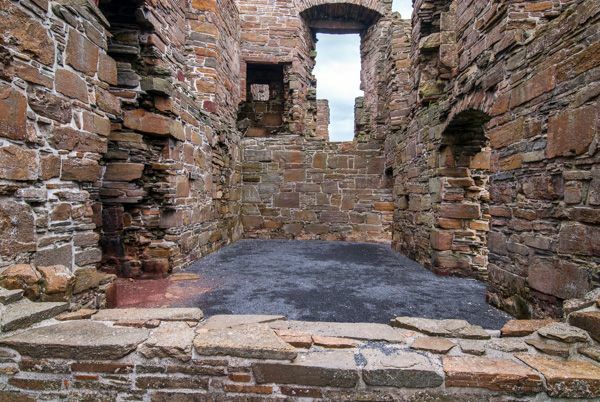 Earl Patrick found time to add a north range and rebuilt the accommodation at Birsay, creating a complex of buildings entered through an ornate gateway, giving access to a central courtyard with two-storey ranges on each side and three-storey towers at the corners. There were service rooms on the ground floor, while the upper floors housed two halls, a long gallery, and a large number of small chambers for the Earl's use. 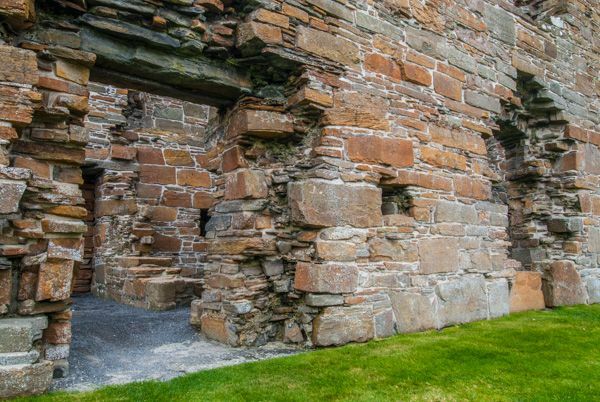 The Stewart's must have expected trouble, for they built gun holes at ground level into every wall. 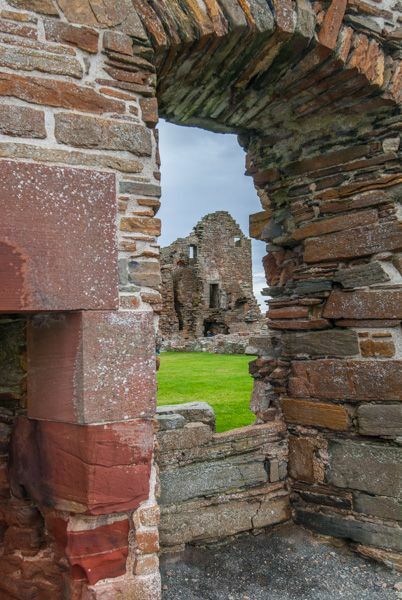 Earl Patrick was arrested in 1609, but his son, Robert, seized the Palace in 1614 and defended it successfully against an attack by the Sheriff of Kirkwall. Bolstered by his success, he marched on Kirkwall and captured his father's Palace there. But his success ended there and Robert Stewart was also arrested, like his father, and they were both executed in 1615. Perhaps some indication of the Earl's character can be gained from the tale that his execution had to be put off while he learned to recite the Lord's Prayer! The Palace continued to be used into the early 18th century but eventually fell into ruin. Despite this, it is remarkably complete; only the roofs are missing, and the rest of the Palace is still in remarkably good condition. The location is simply stunning, with views to the tidal island of Birsay. Location: In Birsay village, off the A966. Ample parking on the side of the roadway. Nearby accommodation is calculated 'as the crow flies' from Birsay Earl's Palace. 'Nearest' may involve a long drive up and down glens or, if you are near the coast, may include a ferry ride! Please check the property map to make sure the location is right for you.